If you have your heart set on our beautiful wedding venue in Cheltenham this winter, let us help you with some creative Winter Wedding Ideas! At Manor By The Lake we are great fans of this time of year as couples have the chance to get creative. This season is an increasingly popular one and offers many benefits, so we’ve listed some things you can do to make it extra special! Winter weddings are a great time for brides to do something very different, creating an oportunity to take some fantastic photographs. 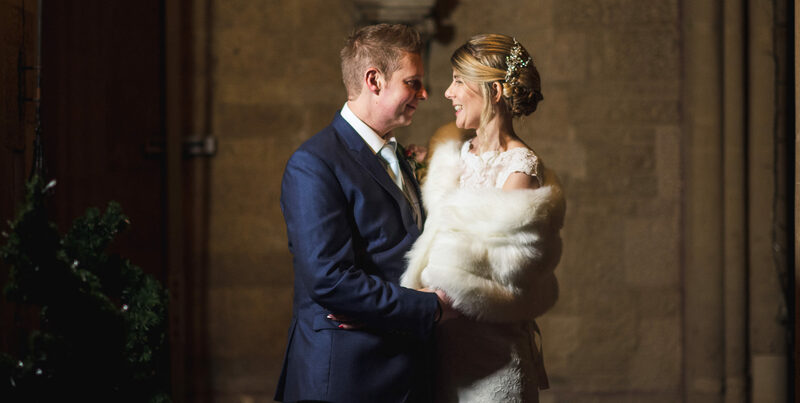 Beautiful wedding dresses featuring faux fur stoles and creative wraps, along with some distinctive winter shoes will look fantastic whilst also keeping you nice and warm. Use a stronger signature colour through your bridal theme; make your bridesmaid’s dresses more dramatic and use this opportunity to encourage the groom, best man and the ushers to make a bold colour statement too. If you’re struggling with your winter wedding ideas ask to view some of our wedding albums or talk to one of our team to help give you some direction. As your guests arrive, instead of bubbly, greet them with mulled wine for that extra special twist. Yes, often reserved for Christmas parties with friends, mulled wine on a winter wedding day is one of our most popular winter wedding ideas which will warm their hearts as they arrive. Break from tradition and have a cheese cake instead of a regular wedding cake, and offer your canapés fresh from the oven too, it will bring a smile to everyone’s face as they realise you’ve taken their comfort on arrival into account. Last year, at Manor By The Lake, we offered a winter wonderland theme option for our couples – it was so popular it was still in demand all the way through to March. With a fabulous ballroom, decorations, sparkling lights and decorated winter trees, guests felt they were in a seasonal paradise. Don’t feel restrained, explore your own winter wedding ideas; remember this is the season of parties and fun. Whilst many now theme their wedding breakfast from the movies or famous novels, there’s nothing to say you can’t take it a stage further with treasure hunts and competitions, just like Christmas! A lot of people get hung up on our British weather, but to be honest, we do quite well in winter. Outdoor light has a softer hue which allows the detail in the white of your dress to show through making your photographs look fantastic. Some of our photographers’ most striking work has taken place during the clear winter nights, with deep blue skies and warm lighting around the gardens and the venue itself they’re never stuck for winter wedding ideas. The Manor By The Lake team can decorate the paths around the lake with festoon lights and outdoor candles and lanterns, which can make shimmering reflections in the water, giving the approach to the Manor a truly magical feel. If you’re lucky to have snow, what more beautiful way to arrive at the manor than a horse drawn carriage surrounded by gardens of white. Let’s face it, Manor By The Lake is a superb venue due mainly to its splendid rooms, many of which feature impressive Victorian fireplaces and amazing period décor. All through the cooler months we light log fires which brighten up rooms and make the atmosphere pleasantly warm and welcoming. Why not have a selection of photographs of the bride and groom placed around the fireplaces, the grand piano and the rest of the Manor to make it feel like it’s your very own luxury home. These could feature family, friends, special occasions and loved ones who can’t be there on the day. There are other great benefits for choosing the winter months. There is more availability during November through to March so you can chose a day in the week that suits you and your families better. Because of this it can also be significantly more cost-effective allowing you the option of making savings which could be put towards an exotic honeymoon in a warmer part of the world. Fly to the Caribbean, Maldives or even Australia, the weather there will be nice and warm allowing you to take an extra ‘summer’ break, just when you need it. If you need help with your own winter wedding ideas, let us know, we have a great deal of experience. We also have a number of last-minute and cancellation dates still available, it’s always worth getting in touch to see how we can help. or call 01242 245 071.